Why fermented raw seeds for dogs? I learned during a nutrition course that feeding raw pumpkin and sunflower seeds provide raw fed dogs with important minerals and vitamins. Seeds are considered a BARF. BARF is short for Biologically Appropriate Raw Food. Some of these mins. and vits. are known to be low in a raw diet so feeding the seeds in an available way is a great boost. 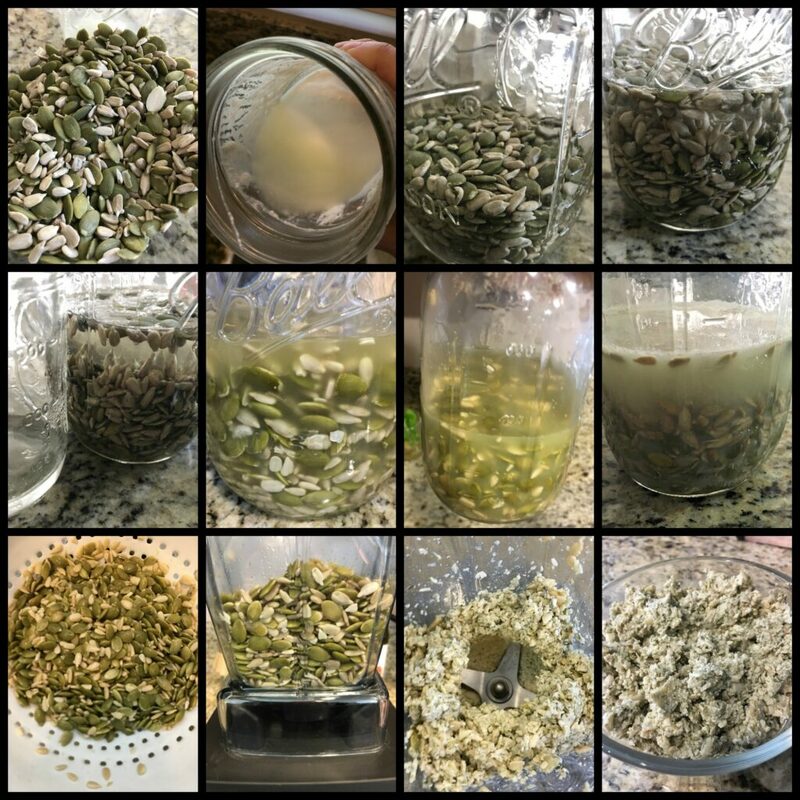 I used to soak the seeds in filtered water just like I would prior to making seed milk or nut milk for humans and then I would blend the soaked seeds into a paste and feed it intermittently as “mineral and vitamin booster balls.” The idea behind soaking the seeds is to open them up, making them easier to digest for optimal absorption of the key goodness they offer. I later learned raw pumpkin seeds are a natural anti-parasitic preventative/treatment that helps with roundworms and tapeworms and I was pretty stoked! I am always trying to find a natural way to prevent or treat something that our dogs may be afflicted with in life. I did some learning and I make the paste as a staple part of our dog care routine but I now ferment the seeds first. I make a new batch and feed it to both of our dogs every few weeks, every day; at each meal until the paste is gone. It lasts about two weeks. We’ve never had any worms so far (knock on wood!). In the US, people like to ask to see studies that prove a holistic method of treating or preventing something actually works. It is a common practice in Germany for humans to deworm themselves via raw pumpkin seeds. This trickled over to livestock and then eventually to other animals such as the domesticated dog. Pumpkin seeds contain the amino acid Cucurbitacin. Cucurbitacin eliminates intestinal bugs by acting as a dewormer. This study published in 2016 by Maciej Grzybek concluded pumpkin seed extracts are effective. Particularly note references 22,23,& 24. Raw sunflower seeds offer dogs magnesium, manganese, phosphorus, selenium, and vitamins B1, B3, & B6. Sunflower seeds are high in vitamin E and offer immune support, heart support, and are a natural anti-inflammatory. The benefits that sunflower seeds hold are why sunflower seed oil is a commonly found addition to commercially made BARF premade grinds. Raw pumpkin seeds offer dogs protein, amino acids, fiber, iron, copper, phosphorus and magnesium, calcium, zinc, potassium, folic acid, and niacin plus the above mentioned antiparasitic benefits. I first saw fermenting seeds on the Canine Ascension site in 2016. Like I said earlier, I had been feeding them ground into a paste but NOT fermented. I fermented for my family a lot but not for our dog very much (we had one dog at that time) so this intrigued me. I ferment vegetables, make kombucha, and a bunch of other fizzy foods because I know how healthful fermented foods are and how beneficial they can be. I worked in human nutrition several years ago and can tell you that fermenting foods is A BIG TIME gut healer and proactive way to give gut support to a healthy gut too. 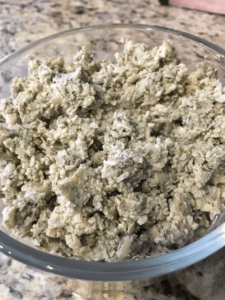 Fermenting seeds for dogs does what fermenting veggies does for them: Fermenting the foods makes them more bioavailable. Which pretty much means, more of the beneficial goodness the seeds offer can be absorbed by the dog eating them. Plus it gives some probiotic too. Begin collecting the whey your kefir naturally creates each day when you tend to your batch. Sometimes this can collect very fast and other times it takes awhile. It all depends on your kefir and the environment it’s fermenting in. 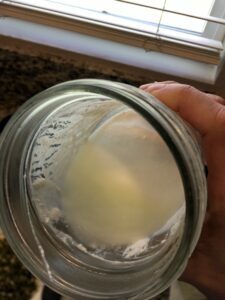 When I started fermenting seeds, I wasn’t using my own kefir whey. I bought it from other people who were able to grow large amounts of healthy kefir. The backstory to that is: Even though I have fermented veggies for YEARS, milk kefir always eluded me. I always failed to grow the kefir and the whey never appeared for me. I met a raw feeder in 2017 who gifted me what I call “the magic grains.” She gave me a jar, a tablespoon of grains, and told me to go forth and prosper. That I couldn’t go wrong and just keep tending to them. She changed my kefir game! I now grow a ton of kefir and I pay the kefir karma forward by gifting my own new growths of the “magic grains” to other raw feeders. The whey that separates is pretty awesome and pretty quick too. You could use it for human smoothies if desired. The kefir whey is your starter culture. The Lactobacillus bacterias in whey are “good” bacterias and they are what are needed to start the fermenting process. You want to collect about ten tablespoons of whey because you need about half of that amount and sometimes spills happen. Ferment the seeds in the water and whey for 24-48 hours. Store in a glass, air-tight container in the refrigerator. This paste will turn (go rancid) quickly so be sure to store it in air-tight glass and use it within the first two weeks. You’ll notice when it is beginning to turn. 1 teaspoon per 10 lbs. of body weight. Dosage Tip: My Adult Lab that fluctuates between 85-90 lean lbs. gets 3 tablespoons. Hi, can you freeze the fermented Seeds once you have ground them up in a paste, or does that take away some of the nutritional value? You can! I actually freeze them into molds often. I’ll make some today and post them on my IG this week! You lose a very minimal amount of value in the freeze. Truly not enough to impact. If you keep in fridge, be sure to use within a week. Thank you so much for my jingle all the whey starter kit! We totally love it. You’re so welcome, it was great seeing you. Merry Christmas! 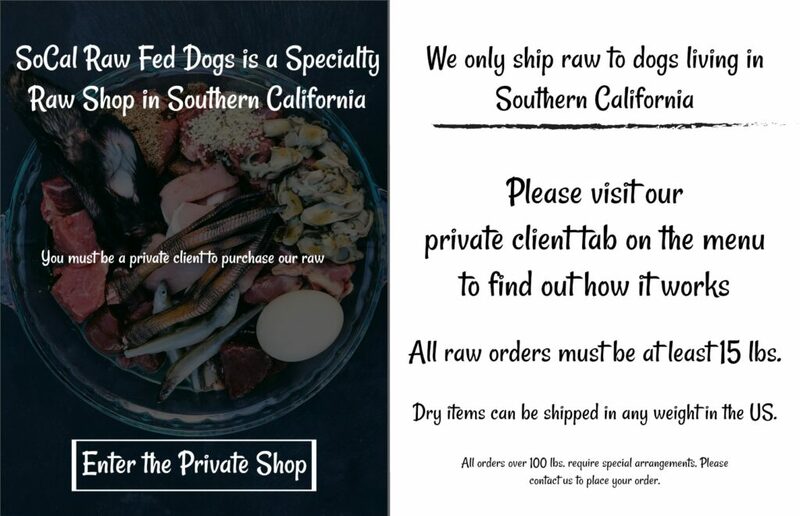 Your site and Facebook group are my favorite sources for feeding my dogs better. I can’t wait to get my magic grains from you and get started!